Ovariohysterectomy is the proper medical term for spaying a female animal. The surgical procedure consists of the removal of both ovaries and the uterus. Although it is a commonly performed procedure, ovariohysterectomy of the dog is a major surgery involving general anesthetics and sterile techniques. Prevention of pregnancy and heat periods is the main reason for the surgery, but the procedure is also performed as treatment for severe uterine infections, ovarian and/or uterine tumors, and some skin disorders. Although there is slight discomfort for a couple of days after the surgery, recovery is rapid in most cases. There are usually no sutures to be removed as they are under the skin; however in some cases external sutures will be placed. These are generally removed 14 days after the procedure. 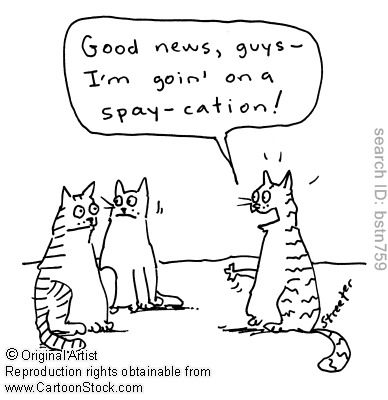 Ovariohysterectomy is the proper medical term for spaying a female animal. The surgical procedure consists of the removal of both ovaries and the uterus. Although it is a commonly performed procedure, ovariohysterectomy of the cat is a major surgery involving general anesthetics and sterile techniques. Prevention of pregnancy and heat periods is the main reason for the surgery, but the procedure is also performed in treating severe uterine infections, ovarian and uterine cancer.